At the Herod exhibit at the Israel museum there is a room that is a reconstruction of the loggia, the VIP box from the Herodium theater with its colorful panels on the lower part of the wall and above on light-colored plaster, unique paintings in secco, trompe de l’oeil views through an open window. 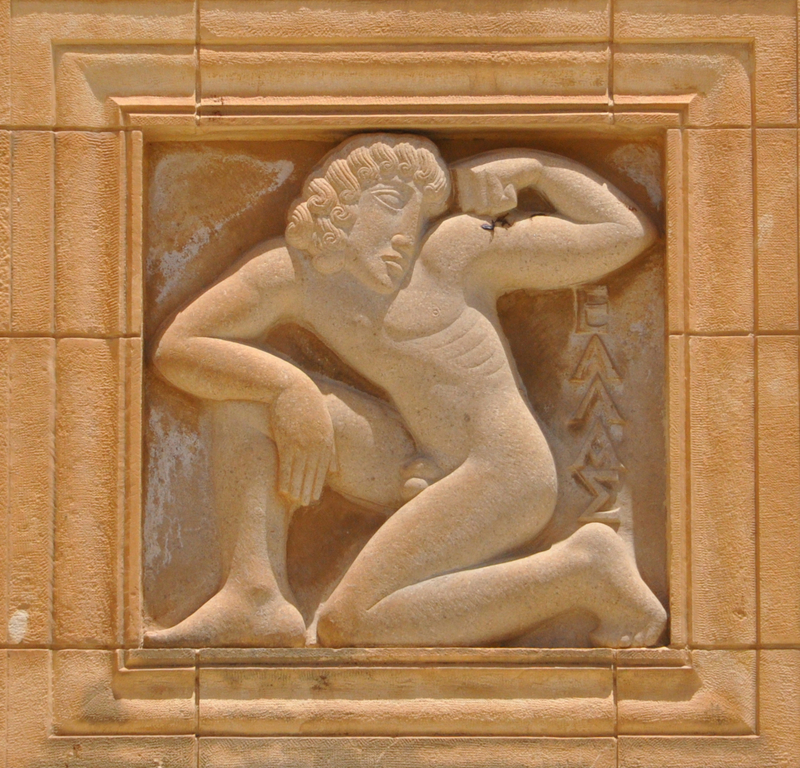 Secco is a technique that requires less artisan skill and used when time is short as in the approaching visit of Marcus Aggripa in 15 BCE. 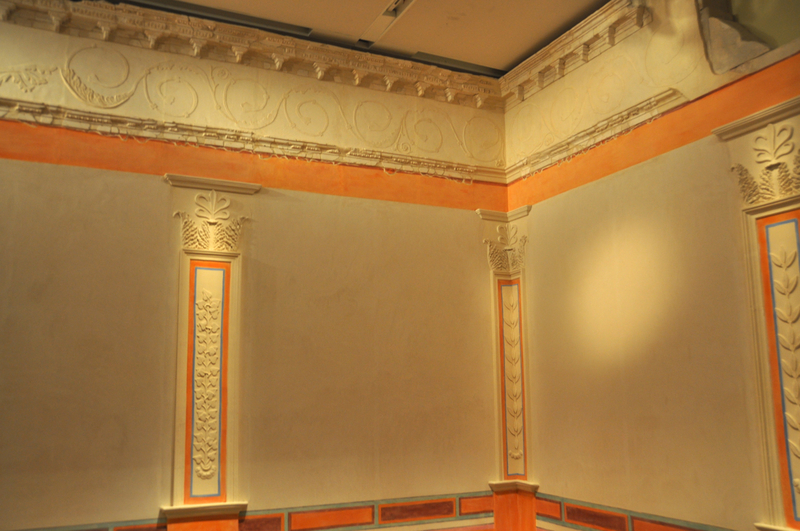 In secco paint is applied on top of dry plaster whereas in fresco the paint is added while the plaster is still wet. 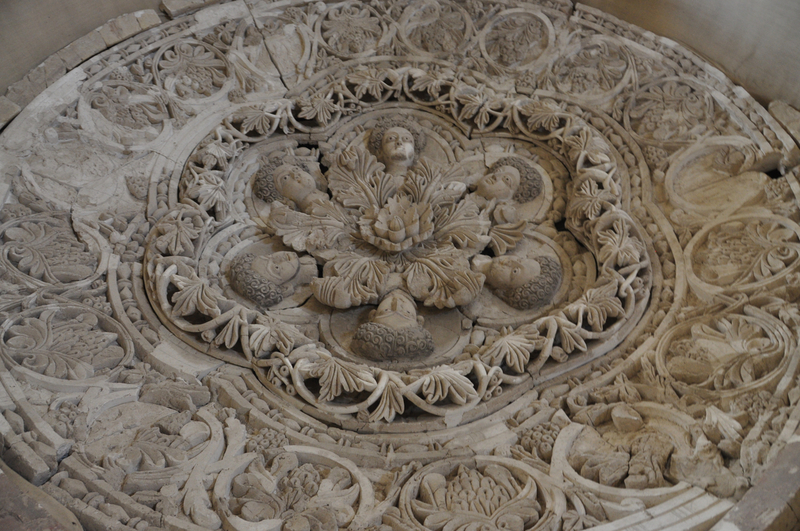 The fresco technique requires skilled craftsmen who have to work applying small areas of plaster, smoothing it and then adding the mineral pigments. 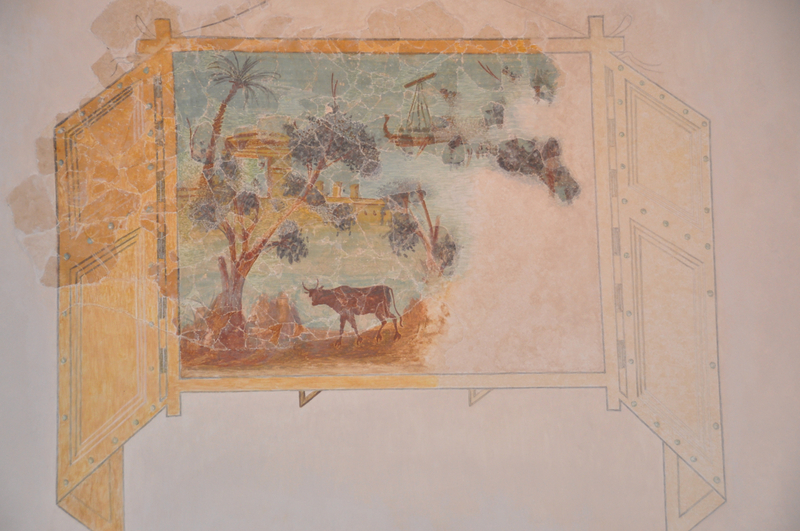 The loggia at Herodium is not accessible to the public, room is enclosed by a wooden structure and a team of conservators are working to protect the delicate secco painting. 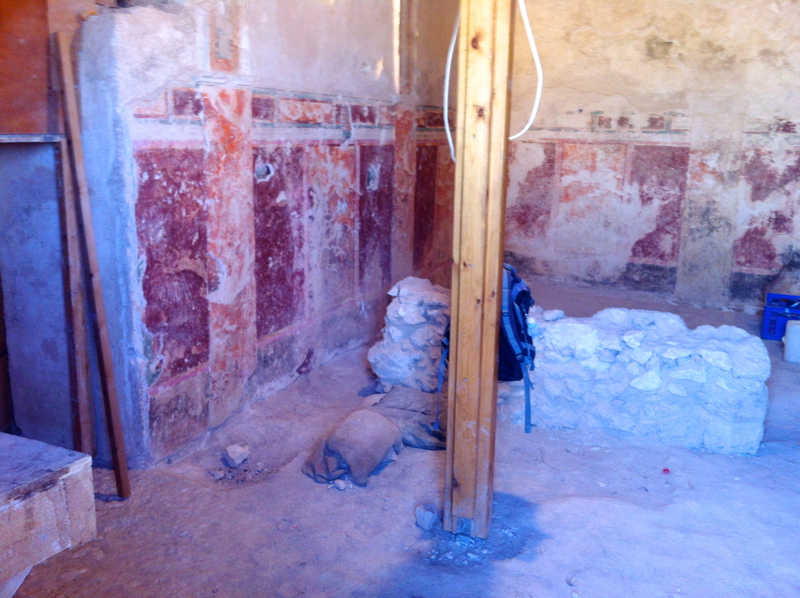 Last week while guiding at Herodium I found the door open and was able to look in for a moment. Hence the photos below were taken in a rush, using my iPhone – since few images of the loggia have been shared I offer them for viewing here. 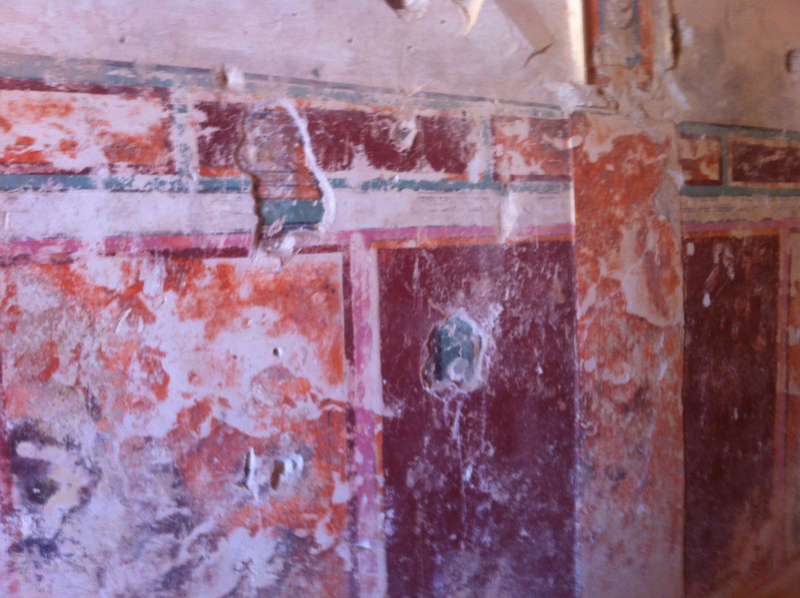 Two things struck me: 1) Through holes in the plaster you can see that the lower panels have two layers of paint and plaster implying that the walls were redecorated, probably for Marcus Aggripa’s visit. 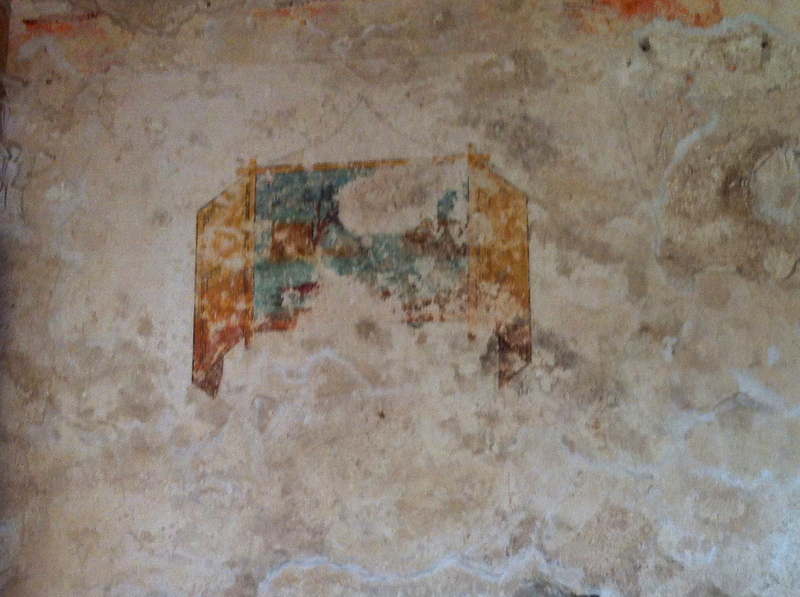 In talking to Dudi Mevorah, curator at the Israel museum, the outer layer is not fresco but a covering done in secco. 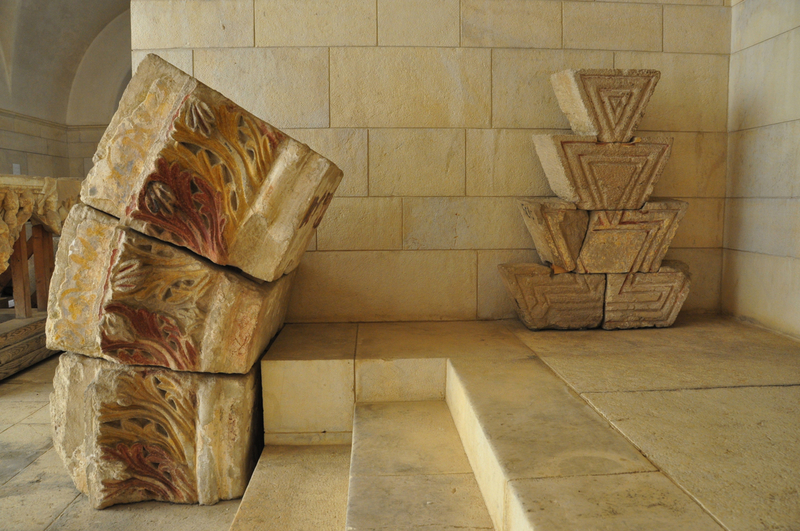 This entry was posted in Archaeology, Architecture, Art, Museum and tagged fresco, Herodium, israel museum, secco on October 15, 2013 by Shmuel Browns. Here is this week’s series of photos, week #3, of different views of Israel Through my Lens. These photos were taken at the Israel museum, Israel’s leading cultural institution and one of the leading encyclopedic museums of the world. 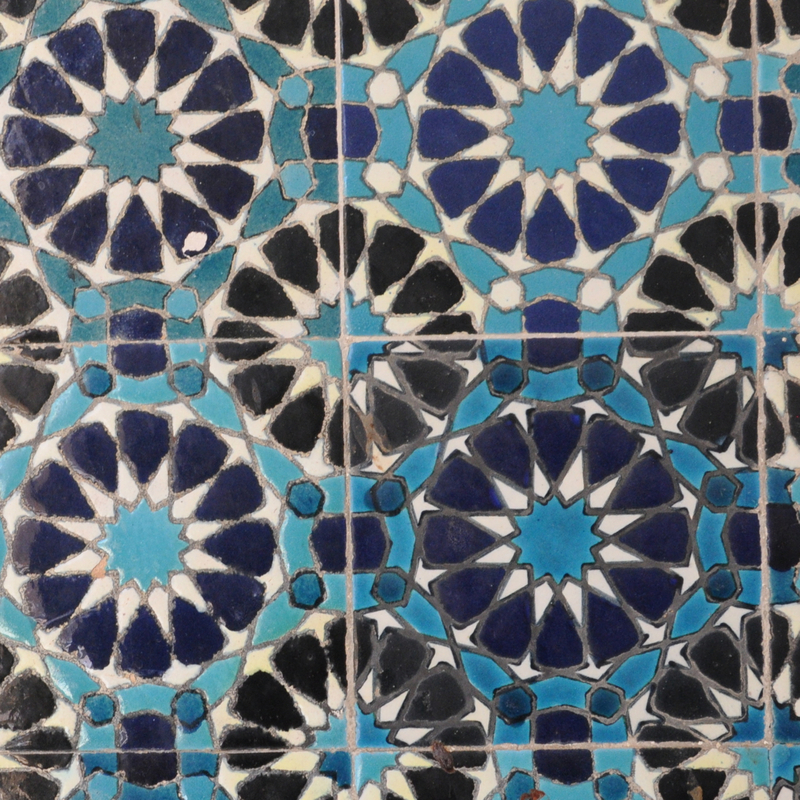 The museum has nearly 500,000 objects of fine art, archaeology, Judaica and Jewish ethnography, representing the history of world culture from nearly one million years ago to the present day and should be on every visitor’s itinerary. The museum campus underwent a major renovation in 2010 that included new entrance pavilions and an underground walkway, lit from the side by natural light with a view of streaming water that cascades down the steps above your head. 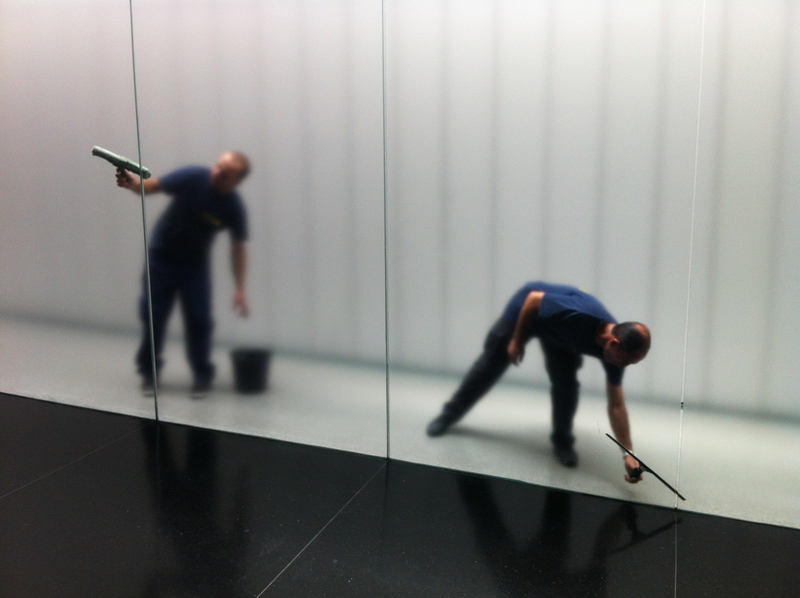 This photo captures two custodians cleaning the glass side wall. When you visit the museum plan some time to experience James Turrell’s installation in the sculpture garden, Space That Sees (1992) part of his “Skyspace” series. Observing the shifting hues and patterns of the sky from inside a pristine, rectilinear space, a shrine-like inner space evoking places of worship like pyramids, mausoleums, or temples, viewers can connect to the heavens. 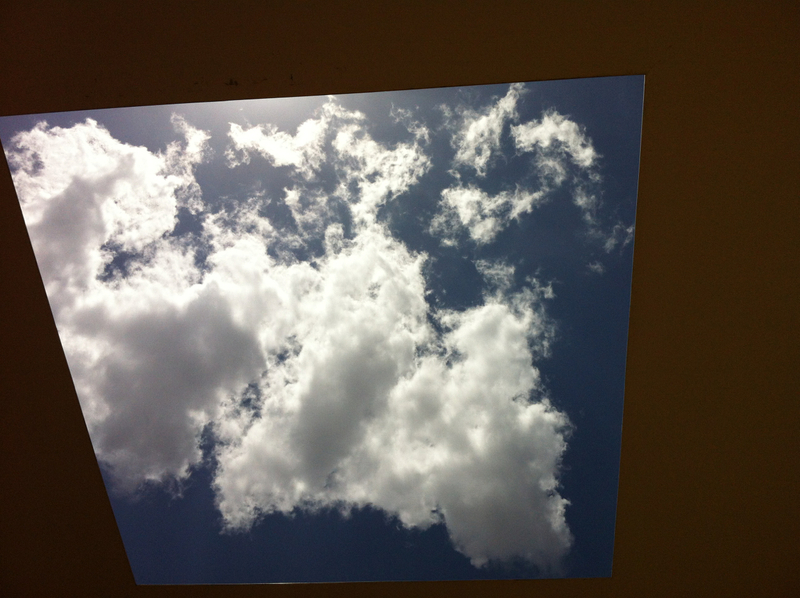 A square opening in the ceiling makes a frame for an ever-changing “picture” of the sky. Turrell, by confronting us with the empty space, turns our mind to our own way of seeing. Another interesting structure is the Shrine of the Book that has been called “a milestone in the history of world architecture”. The two architects who designed it were an odd couple – the pragmatic Armand Phillip Bartos was evidently chosen based on his being married to Gottesman’s daughter (Gottesman was the philanthropist who had purchased the Scrolls as a gift to the State of Israel and donated the money to build the Shrine that houses the Scrolls); the oddball visionary Frederick John Kiesler who critics said had never built anything and was primarily an avant-garde stage designer who taught occasionally. The exterior is dominated by two unique architectural features: a shimmering white dome reflected in a pool of water, representing the “Sons of Light” and a freestanding, polished black basalt wall, standing for the “Sons of Darkness” so vividly described in the War scroll. 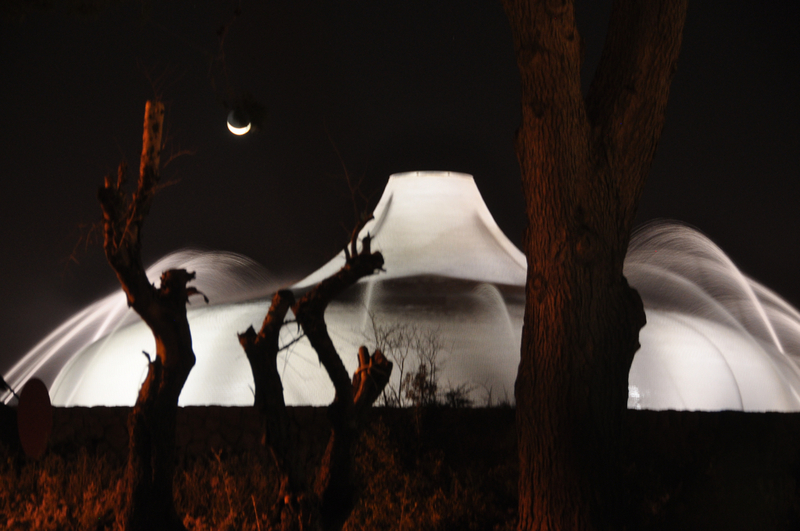 This photo captures the white dome under a cascade of water at night. This entry was posted in Architecture, Museum, Photography and tagged israel museum, James Turrell, Sculpture Garden, Shrine of the Book on August 19, 2013 by Shmuel Browns. 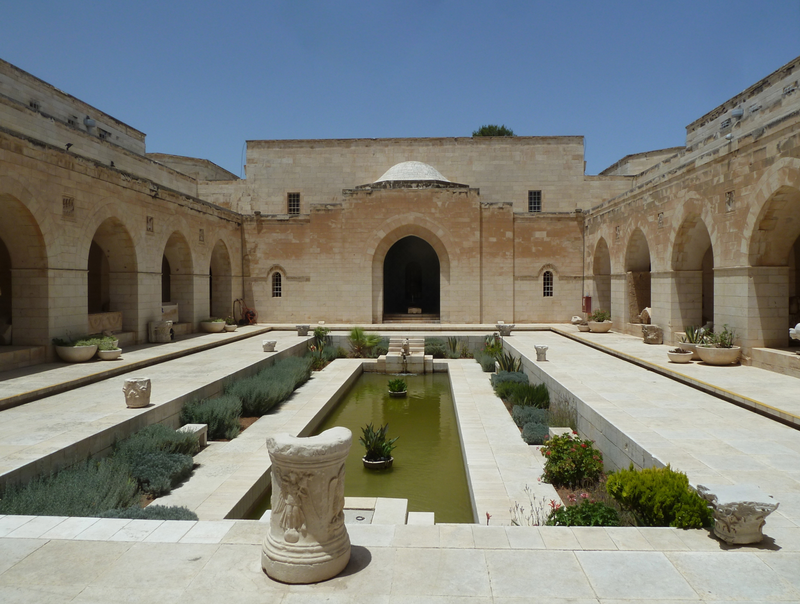 Although few visit, the historic Rockefeller museum in Jerusalem is definitely worth a visit. A blend of western and local eastern architecture, combining historic architecture with modern innovations, the museum was built in 1938, during the Mandate period by the British architect St. Barbe Harrison. 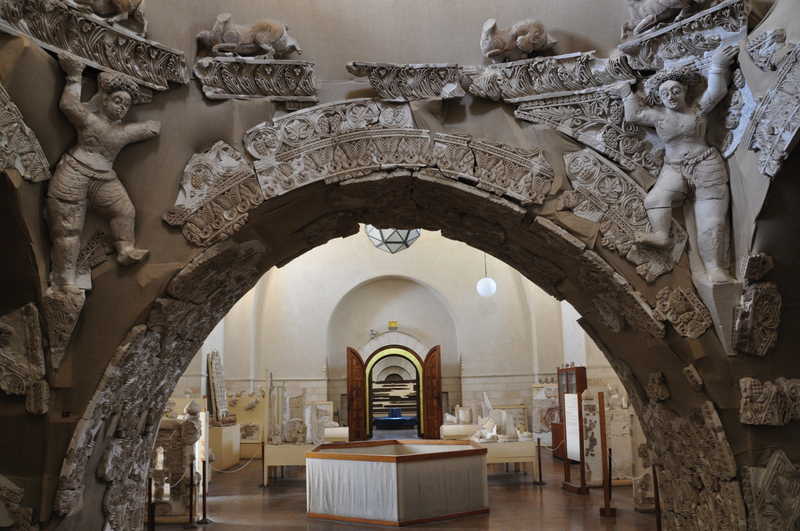 In the main hall is a model of the museum – exit to the courtyard to see the pool, the Armenian mosaics by Ohanessian and the 10 iconic stone reliefs sculpted by Eric Gill representing the major civilizations that left an imprint on this region. Many of the exhibits in the museum are a little dated, walnut wood framed glass cases with dozen of artifacts each, labelling is just a number which you have to cross-reference with a mimeographed book that you can ask for at security. But they have some important pieces: the Crusader marble sculpted panels from the lintels of the entranceway to the Church of the Holy Sepulcher, Roman sarcophagi, Umayyad architectural details with their original paint, Crusader capital with goblin from Church of Annunciation, mosaic from an early synagogue, like the one in Jericho also called Peace unto Israel, found in the Druze village of Usifiya. 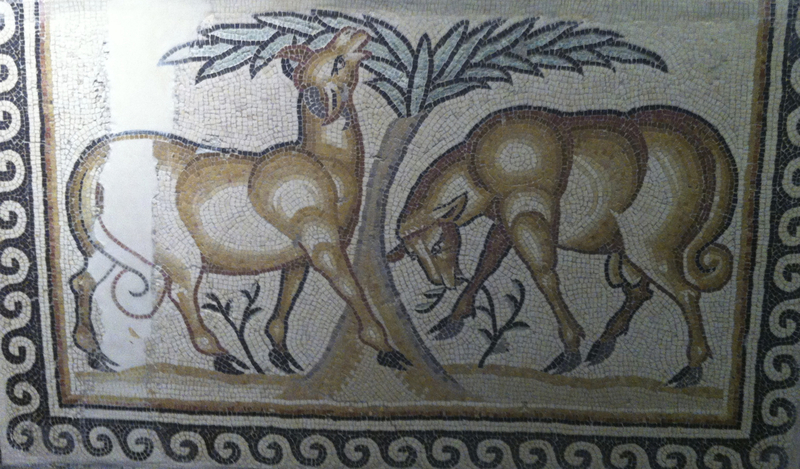 Having visited the actual site of Hisham’s palace in Jericho and been disappointed at how few of the mosaics and artifacts are on display it was heartening to see the impressive exhibit of sculpture and stucco from Hisham’s palace safe at the museum. 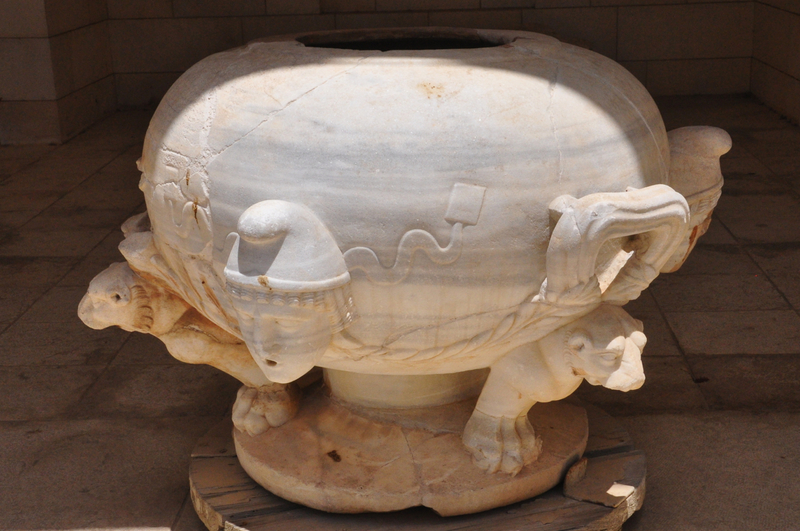 An incredible piece in the courtyard is a Roman wash basin from the 1st century that was found in the Crusader fortress at Montfort – striking how similar it is to the basin that Emperor Augustus sent with Marcus Agrippa as a present for King Herod on display at the Israel museum exhibit on Herod (viewable at https://israel-tourguide.info/2013/02/14/herod-design-realpolitik/). A species of frog that was recently rediscovered after being declared extinct in 1966 has been reclassified as a “living fossil”. Israel’s Hula painted frog had not been seen for nearly 60 years, but in 2011 one was found lurking in a patch of swampy undergrowth. Tests have revealed that the frog belongs to a group of amphibians that died out 15,000 years ago. BBC interviewed me for their series, In the Prince’s Footsteps and asked me to take them to the Mar Saba monastery in the Judean desert. We talked about photographer Francis Bedford’s 1862 photograph of the monastery on his travels with Edward, Prince of Wales to the Holy Land. 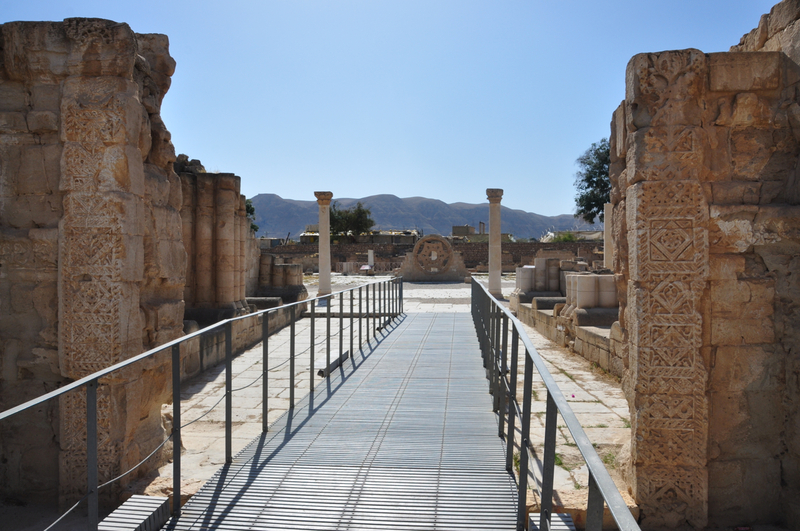 You can read my blog post at Mar Saba and Judean Desert Revisited. You can hear the interview by clicking on the red button. I am Gabriel A unique 87 line Hebrew inscription, ink on stone, from the beginning of the Roman period, I am Gabriel, is on display at the Israel museum. Its content is prophetic-apocalyptic, its style literary-religious, and its language reminiscent of the later books of the Prophets. 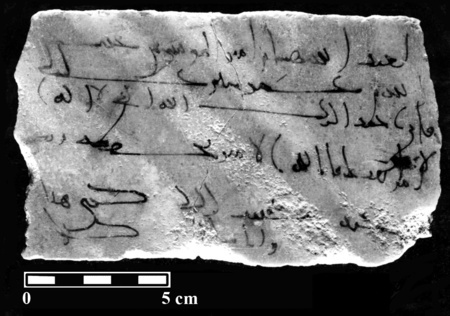 Accompanying it are rare ancient manuscripts, the Hebrew Bible, the New Testament and the Qur’an. The exhibition traces the changing roles of the angel Gabriel in the three monotheistic religions. 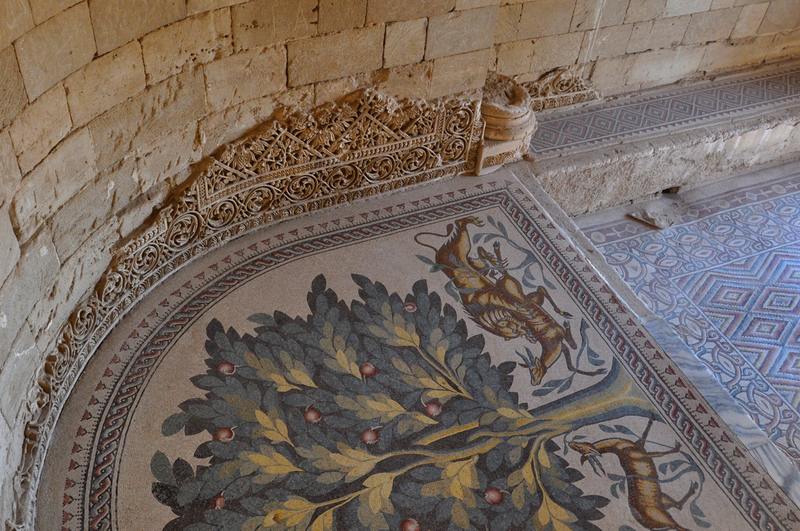 This entry was posted in Archaeology, Architecture, Art, Desert, Mosaics, Museum and tagged Francis Bedford, Hula lake, Jericho, Judaean Desert, mar saba, Rockefeller Museum on June 13, 2013 by Shmuel Browns. I was visiting with friend and fellow tour guide, Tom Powers, in Bethlehem and we were talking about our interest in photography and what you can learn by comparing photographs taken 100 years ago or more with the same scene today. I mentioned Francis Bedford’s photographs from Edward, Prince of Wales visit to this area in 1862 and my guiding for the BBC to Mar Saba and my blog post https://israeltours.wordpress.com/2013/03/19/mar-saba-and-judean-desert-revisited/. 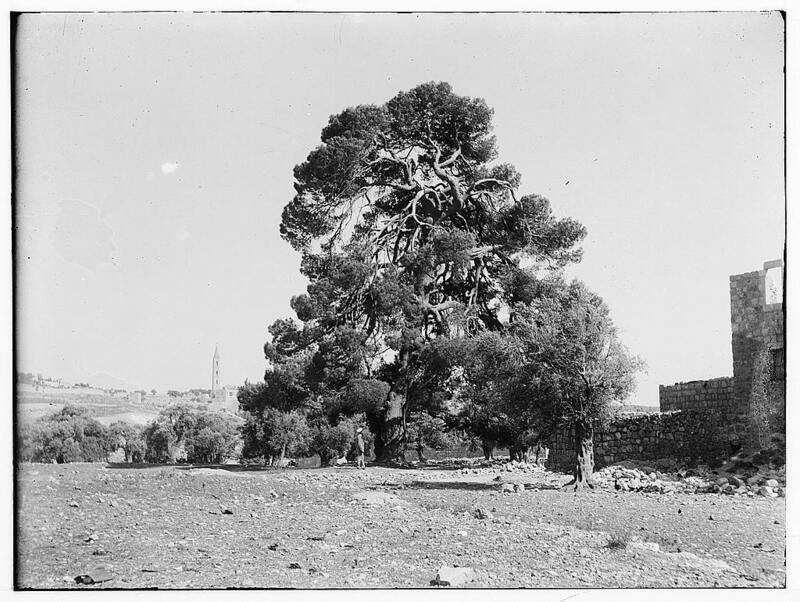 This reminded Tom of a photograph from the Matson collection, image #00776, titled “Prince of Wales Tree near Palestine Museum” (link to the image online at http://lcweb2.loc.gov/service/pnp/matpc/00700/00776v.jpg). Tom did the research and wrote the captions for several hundred high-resolution photographs taken between 1898 and the 1940s in the American Colony and Eric Matson Collection. The complete set of photographs, some 4,000 images has been produced as two DVDs by Todd Bolen – http://www.lifeintheholyland.com/49_matson_american_colony_8_volumes.htm. The area pictured lies north of the northeast corner of the Old City. The view is to the southeast, with the Russian Ascension Tower on the Mount of Olives visible on the skyline (left). The Rockefeller Museum buildings, if they are visible at all (through the trees), would be in an early stage of construction. Muhammad al-Khalili, who served for a time as Mufti of Jerusalem, built a two-story summer residence here in 1711, the structure seen at right, which came to have the name Qasr el-Sheikh. It had an olive press on the ground floor and living quarters above and was one of the first buildings ever erected outside the Turkish city walls. Such buildings were especially useful for guarding the agricultural fields that covered the area, and the property of “Karem esh-Sheikh” was planted with olive and fig trees, date palms, and of course grapevines. As for the tree, it is said that Muhammad al-Khalili brought the pine seedling from Hebron, wrapped in his head-covering, and planted it here. When it was grown, the venerable pine seems to have become a well-known local landmark, and over the years numerous dignitaries, including members of the British royal family, enjoyed its shade. Among them was Edward, Prince of Wales (later to be crowned King Edward VII) who visited Jerusalem in 1862 and made his encampment here, hence the tree’s name. In 1865 Prince Arthur likewise camped at the site. In the late 19th century the Muslim Rashidiyah School was built on part of Karm el-Sheikh and it remains in use today as part of Jerusalem’s public school system. At the beginning of the 20th century the Arab neighborhood of Bab a-Sahairah, named after the nearby city gate (Herod’s Gate), grew up in the surrounding area. 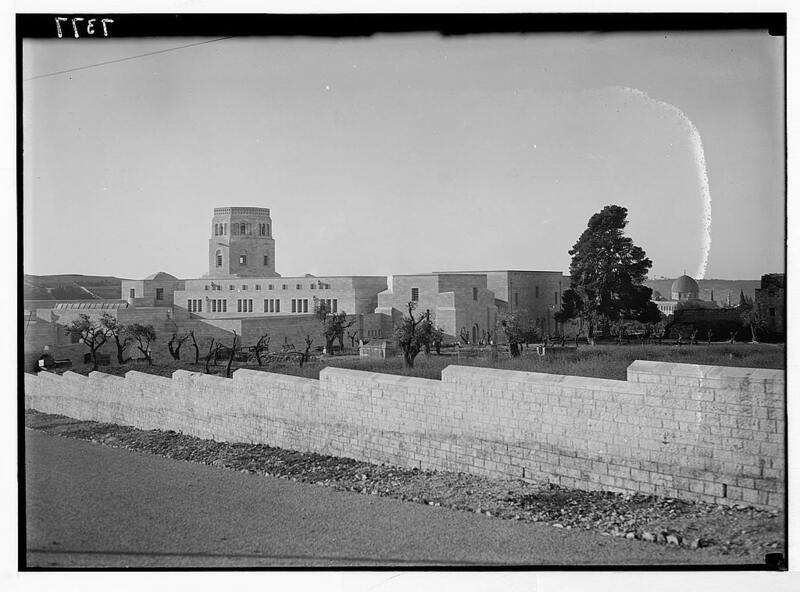 Then in 1919 the Mandatory government selected the site for the construction of an archaeological museum, although it was only in 1930 that the eight-acre tract, Karm el-Sheikh, was purchased from the al-Khalili family and the cornerstone was laid. 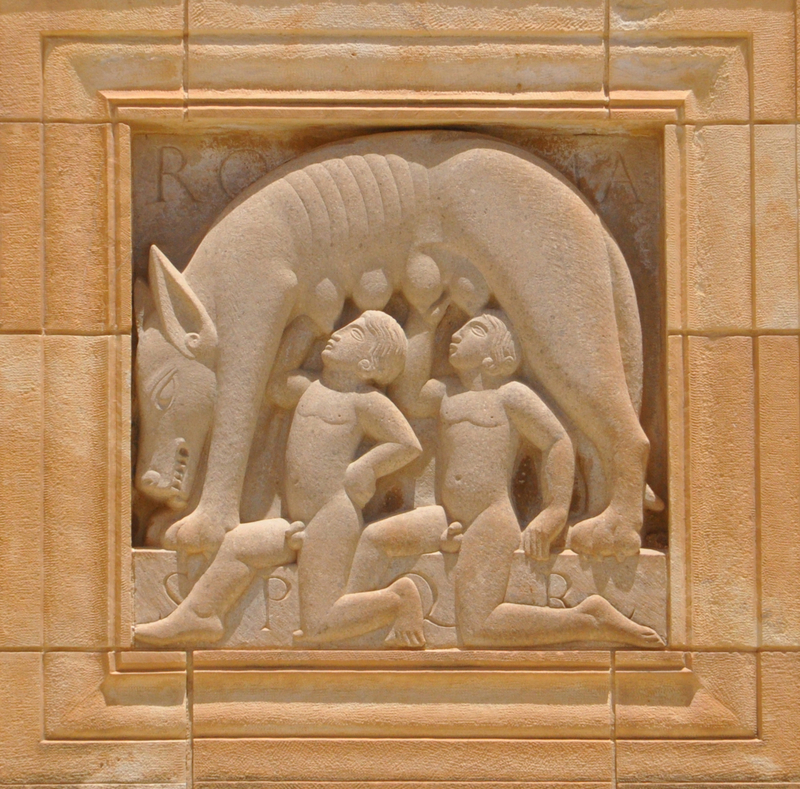 Construction was completed in 1935, and the museum officially opened to the public in 1938. At the time the Rockefeller Museum was coming into existence, the old “Prince of Wales Tree” still stood here, just to the west of the main museum site. 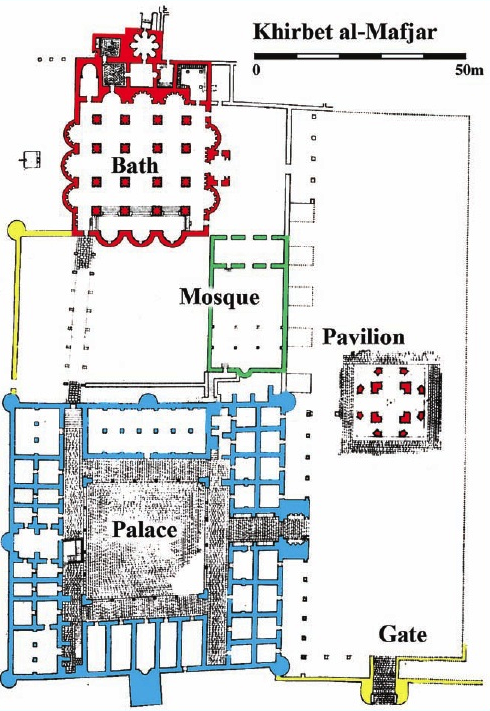 In fact, the original architectural plan called for a rear (western) courtyard surrounded by cloisters, which would communicate between the historic villa structure, Qasr el-Sheikh, and the main museum building. And the old pine tree, at the suggestion of Rockefeller himself, was to have pride of place at the center of this court, as “an ‘organic’ counterpart to the imposing tower” at the front of the building. This meant, in concrete terms, that the central axis of the entire museum complex was aligned on the tree! 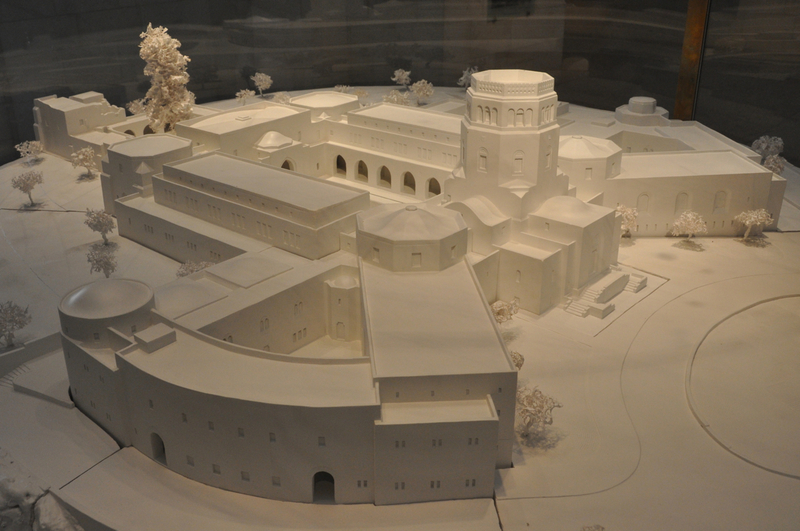 In the end, the envisioned rear courtyard was never realized, nevertheless the venerable tree — through all the vicissitudes of British, international, Jordanian and then Israeli control – stood as a silent witness behind the museum. In its later years it was actually propped up by a special concrete buttress, however by 1988 the so-called Prince of Wales Tree – then close to 300 years old – had finally died and had to be cut down. The great stump is still visible behind the museum. 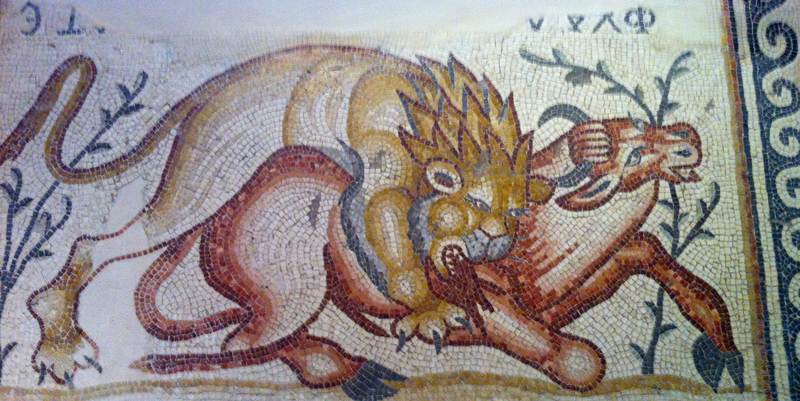 As for the historic villa, Qasr el-Sheikh, much of it remains intact; restored and modernized, it today houses the Restoration Department of the Israel Antiquities Authority. This entry was posted in 1900s Photos, Architecture, Jerusalem, Museum and tagged ancient pine tree, Judean desert, mar saba, Rockefeller Museum on June 5, 2013 by Shmuel Browns.